Times will vary (30 - 45 MINUTES). Maintain a relaxed pace and allow adequate time for meditation / relaxation while at the center. Each movement entering and departing should be controlled, focused, and done in silence. Allow your other senses (sight, hearing, smell, touch) to be heightened throughout each stage of the exercise. At the conclusion of the walk of the labyrinth, you should experience a sense of being centered, having a strong ki flow, and conscious of a clear and relaxed mental state. 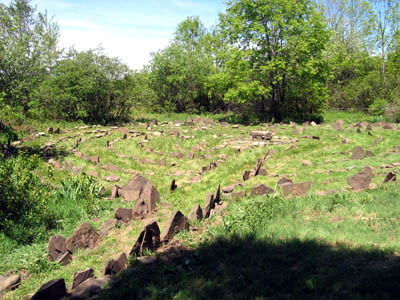 A labyrinth is a single path tool for personal, psychological and spiritual transformation. It is a structure containing an intricate network of winding passages hard to follow without losing one's way. The true labyrinth has no false pathways or dead ends to confuse those who follow its winding course. The mouth is where you enter. You walk on the paths or circuits. The walls keep you on the path. The goal is in the middle of the labyrinth. When you reach it, you have gone half the way. You need to turn around and walk out. Mosaics from the Roman Empire often depicted labyrinths as strongholds or fortified cities. Throughout the world there exists a symbol - a series of concentric lines, carefully connected. This symbol, and its family of derivatives, has been traced back over 3500 years; it occurs in different cultures, at different points in time, in places as diverse as Peru, Arizona, Iceland, Scandinavia, Crete, Egypt, India and Sumatra. The lines of contact between these widely spaced bursts of labyrinth are difficult to trace, and its origins remain mysterious. Labyrinth structures are right brain activity enhancers. By more frequently using the left hemisphere, considered as rational, we leave out the possibility of taking advantage of the benefits brought by the right hemisphere, such as creative imaginati on, serenity, global view, capacity of synthesis and ease of memorization, among others. By means of various techniques we can stimulate the right side of the brain and search the integration of the two hemispheres, and thus, balancing the use of our potentialities. Some of the earliest forms of this labyrinth can be found in Greece, dating back to 2500 -2000 B.C. These are called Cretan labyrinths or classical seven-circuit labyrinths. 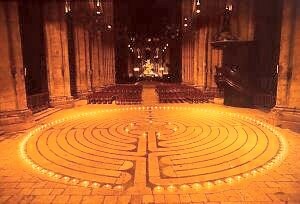 The labyrinth (pattern) built into the floor at Chartres Cathedral was also found on coins minted at Cnossus. Other ancient labyrinths date back to early Egypt, Peru, India, and even the Native American nations of the Southwest. The labyrinths were used for ritual walking and spiritual contemplation. Often called “city of turns” labyrinths were equated with Holy cities such as Troy, Jericho, and Jerusalem. Labyrinths have been potent symbols in many cultures for thousands of years. The early Greek circuit was known as the labyrinth of the Cretan Minotaur. In mythology, the engineering genius Daedalus is credited with having contrived the labyrinthine floor in Cnossus as a dancing floor for the king Minos' daughter Ariadne. The thread that was used to find the way out is a metaphor for the silken thread produced by the spider. Within the confines of the labyrinth, the minotaur (a creature part bull - part human) was held as a means of humiliating King Minos. Poseidon (god of the sea) sent this horrible step-son to Minos because he had failed to make a fitting sacrifice to the powerful sea god. In a subsequent Greek myth the hero Theseus finally killed the Minotaur. Theseus defeated the beast at the heart of darkness - and created a myth that is still vibrant and captivating some 3000 years later. Be aware that a labyrinth is different than a maze. A maze is made up of dead-ends, false pathways, traps. 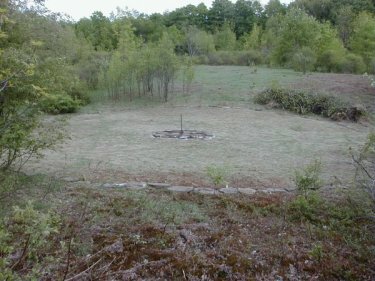 A labyrinth, on the other hand, has one path - to the center, and then back out again, transformed. The spiral pattern is the most generative form of subtle energy. When its coil is unwound the stored energy is released. Circles (circular motion) are rich in both yin and yang (yin underground water crossing yang energy lines). The labyrinth resonates to this numinous (magical power) spiral, the Phi ratio known as the 'Golden Mean' (the most pleasing shape, it is incoporated into many aspects of art) found in all of nature. In the martial arts it is referred to as ki, chi, or our life force. Equated with the brain many cultures believed that the labyrinth could cure illness. Today the labyrinth is known to have a curative effect on certain ailments by producing a sense of well-being and balance through a type of vestibular (passage between) stimulation, accessing both left and right hemispheres of the brain. Remember Theseus? Using the golden thread, he was able to emerge from the Labyrinth after slaying the Minotaur. The thread led him back to the one he loved. All journeys are ultimately through a labyrinth, though mostly this is metaphoric. The golden thread is the truth of our spirits. If we follow it with trust, we will emerge; re-surface from the depths of uncertainty, weakness, and the most difficult challenges. Consider the symbolism of the American Kang Duk Won emblem! (The fist enters from darkness into light (awareness, knowledge)). Similarly, a martial artist's training is a journey. Through many turns, twists, belt ranks, and redirections as years of training progress. Much like the Greek hero Theseus, cautiously and confidently finding his way out of the labyrinth, or the pilgrims getting the full experience of the stained glass windows, the magnificent designs of the architecture, and captivating music that filled the cathedrals, or the earliest philosophers seeking to enhance their well-being to better understand inner balance - karate practitioners who enter kata exercises ultimately become more aware by challenging themselves, confronting that which needs to be improved, and recognizing each step of the journey is necessary in their effort to become more enlightened. Chartres (f. pron. “shar' tr”) is a city in northern France and the site of a 13th century Gothic cathedral. It is considered to be a place of spiritual action that possesses the power to transform people, to transmute them into a higher spiritual state. Pilgrims arriving at the Great West Door, the threshold of the cathedral, found they stood more upright with their heads upraised, for the interior design of the cathedral seems to create a definite uplifting effect on the body. 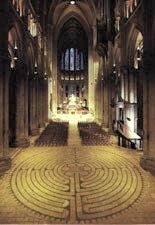 The pilgrim would progress shoeless up the nave (entrance) to the labyrinth, a structure 13 m (42.5 ft.) across and set out in the flagstones of the floor. Dancing around and around until reaching the center, a ritual commonly seen at each of the four annual fairs, the pilgrim became more and more sensitive to the power accumulated in the vast cathedral chamber (music, stained glass, architectural design). Moving to the middle point, the pilgrim was supposed to receive the full force from the luminous light emanating from the three stained glass rose windows. 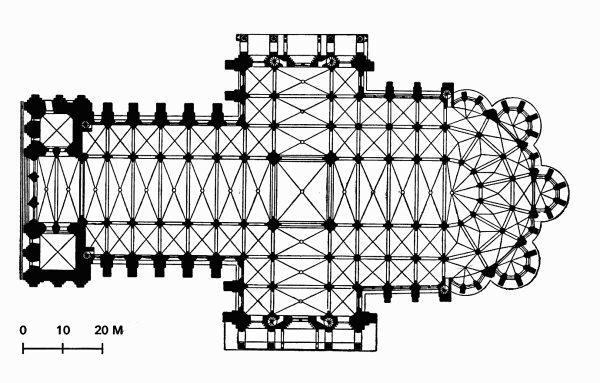 If the pilgrim experienced the entire sensuousness of the cathedral, it would be because the body's senses had apprehended all the musical and geometrical proportions, and all the numbers and lines expressed in the building's interior. Much like a labyrinth, kata practice is an opportunity to become absorbed in motion or moving meditation. A karateka can confront challenges, remain balanced, maintain proper breathing, and strive to coordinate mind, body, and spirit. To dare grapple with something that one cannot possibly defeat brings one into the closest proximity to all that defines success - humility, a deepened awareness on one's limitations, a respect for life itself, the willingness to dare the improbable. Do not think you are drowning in the details of your life. View it as a journey through a labyrinth. Always remember, the longest of journeys must begin with the first step! The seven-circuit labyrinth can be approached as a means to improve the health of the body and mind. The walk should be an active-meditation exercise. Each circuit would be directly related to the seven circuits of the anatomy (left). As you walk the labyrinth, focus on sending positive ki through your body and center specifically on the crown, third eye (inner being), throat, heart, solar plexus, navel, and base (ki spot). 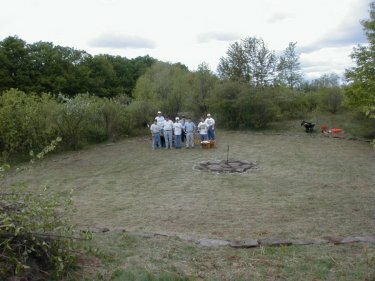 The AKDW labyrinth is approximately 50 feet in diameter and was constructed by members of the Association in the Spring of 2001. Several pictures taken during the construction are given below. 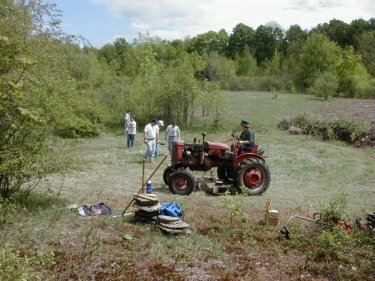 stake near the wheelbarrow, and measuring the radius. 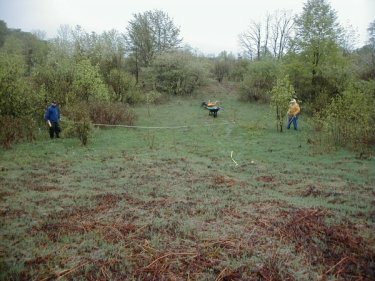 Many hands make light work when clearing the area. Power tools are gratefully appreciated. and the workers gather to appreciate their accomplishments. One last look for an overall view on leaving at the end of the first day of construction. 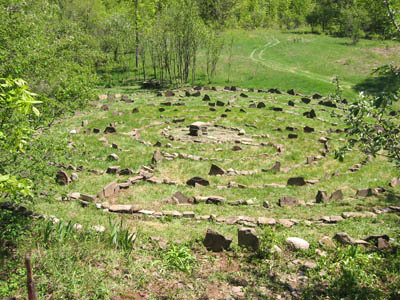 In 2007 the labyrinth received a new look by placing some of the stones on end. The upended stones and their shadows do give a very different appearance to the labyrinth.